For a wedding, for church or an outdoor afternoon event, a special occasion hat is usually warranted and will often turn heads. Simple or outlandish, vintage or modern, a good hat tops off an outfit beautifully. Women have worn hats on special occasions - and indeed, most occasions - for centuries. A woman, particularly a married woman, was not considered properly dressed unless she wore a hat. Hats became so large and elaborate, women were asked to remove them in the theatre so that people sitting behind them could see. When Teddy Roosevelt was president, he urged that the fashion industry make some drastic changes because certain species of birds were at risk of extinction due to their plumage's popularity on hats. Hats grew and shrank, usually in accordance with trends in hairstyles. The famous cloches of the 1920s hugged the popular bobs closely. Trends in that decade veered towards the exotic, so special occasion hats, like those in the early 19th century, resembled turbans. In the 1940s, practicality ruled most aspects of women's dress, but dress hats tended towards the whimsical. This was one area where a woman could have some fun at little expense. In fact, she could even make a hat herself out of scraps. The famous Schiaparelli shoe hat debuted in this decade, but many women could take bits and pieces of felt and netting and whatever else they might have on hand and turn it into a charming hat for going out to tea or dinner. The prevalence of hats dwindled for special occasions and daywear, but there are still places, like the famous racecourse at Ascot, where they are expected. Increasingly, women are finding that a smart hat can turn a good outfit into a great one, and so they are slowly coming back. You don't have to be invited to tea with the Queen to want to wear a hat for a garden party. Sun damage awareness makes many women opt for a hat as well as sunscreen. Plus, it keeps you cooler and looks excellent. 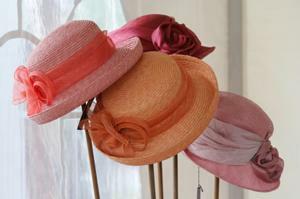 Special occasion hats worn for outdoor events are usually made of a light straw, but can also be made of fabric. Shop carefully so as to avoid a hat made of polyester or something that looks pretty but won't breathe, as you'll be uncomfortable. The most common sort of hat worn for a tea or other formal outdoor occasion features a round crown with a wide brim. A comparatively simple hat is appropriate for daywear, usually adorned with flowers, feathers or ribbons. Hats worn for church at any time of year will be elegant. In summer they are light net, straw or fabric and in winter they are felt, wool or velvet. Because you don't need a brim, the shapes can vary widely, depending upon your hair and style. Brims are often preferred as they can allow for more in the way of fun trim, but it's not necessary. A hat worn for church can be big and even outrageous, but it should always be appropriate to the place. If you have something specific in mind that you can't find, try to find a milliner. A good online source is Couture Creations. You may be pleasantly surprised to find that a custom made hat is reasonably priced. If you maintain it well, you'll keep it - and wear it - forever.